July long weekend is always a recovery period from the craziness of Canada Day at the market. Which had us come across this challenge we found online… “plastic free July”. This just happens to be terribly fitting for Generation Green! With the major expansion of our bulk sections for home, personal, and food products – we are all about cutting down the plastic! To kick off the new month and beginning of summer we’re running a contest to encourge refillables! Stay tuned for details. Plastic free July focuses on ending the use of single-use plastics. This is the thin, weak plastic used for water bottles that is meant to be used one time but exists forever. Did you know that every piece of plastic that has been made still exists somewhere today? It’s so easy to throw out or recycle your plastics and never think about them again, but reality is that although they are out of your space they will be somewhere else on Mother Earth. Plastic free July gives you the opportunity to “take a challenge” to *refuse* single-use plastics. Including bottles, bags, coffee cups, straws, etc.! Now I have a lot of faith that most of our costumer base is already on board with this in their everyday life. The amount of people who don’t take bags for their purchases impresses me daily. So let’s take this a step further and eliminate every piece of plastic from our lives! Everything about plastic is bad. It starts in production. Plastic in no sense is a naturally occurring substance, and what it is made from is *crude* oils. So to create a product like such from oils obviously takes a lot of work which means a toll on the environment. This is specifically why Boxed Water is better and was created. Not specifically because of the recycling regimen but because the production of paper products, even tetra pack, is substantially more gentle on the environment. To take it further than that, the plastic we use is hard on us. Especially if we are reusing these plastics, as we feel we should. But the thing is the more wear, tear, and heat that plastic experiences the more toxic chemicals it leaches out. We know by now it’s *so* easy to eliminate single-use plastics! Bring your own bag, mug, and water bottle and a plastic-free day is yours. But what about those trickier situations that you don’t even think about? What about your toothbrush? Your shampoo bottle? Your food packaging? My number one recommendation is jars, jars, jars! Glass is made out of sand and generally not that bad for the environment. Also it’s amazing how quickly you can start a collection of glass jars by just paying attention. 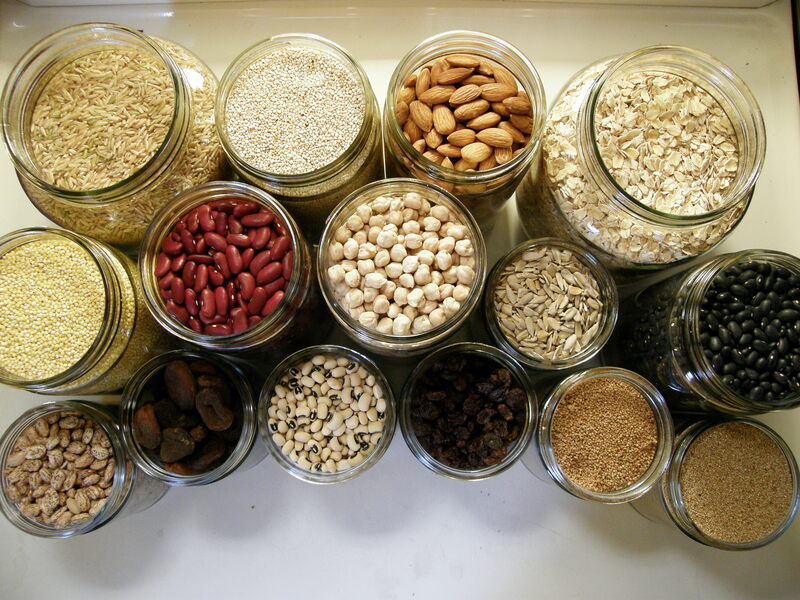 They can be used to organize spices, seeds, nuts, dried fruit, and even start replacing your tupperware! Glass is also much better to store or heat up food. It doesn’t contain the chemicals or toxins that plastic does and you can use them for anything! Salads, leftovers, I’ve even taken cereal to school before in a glass jar and then used it later as my water bottle. We welcome our costumers to bring your own container to use for our bulk sections and glass is our favourite! It’s clean with an easy lid and totally safe for re-use, forever. Other great options include organic fabrics. We have organic cotton produce bags which you can fill with bulk and re-use for produce grocery shopping. Organic plant-based fabrics are biodegradable or compostable and can go back into the earth! P.s I lead you on about waste-free shampoo and toothbrushes so I won’t leave ya curious… We also have bulk shampoo available (plus other toiletries) and a great compostable bamboo toothbrush! This whole month we’re going to encourage YOU to bring us your glass jars. Fill them up with laundry soap, lotions, or rice and we’ll enter you to win a eco-friendly prize pack of reusables and a credit for more bulk! Post of picture of it with hashtag #plasticfreeGG for another entry! And they do this all month long for even *more* entries! Follow our blog to get the real deets on this promotion. So that’s our challenge to you this plastic-free July… keep refusing single-use plastics and start working towards a plastic free month, year, or life!